Afterwards, I took the DART out to Killiney (should have been Dalkey, but I overshot) where Helen Fogerty, daughter of Daithi and Joan Hanly, picked me up in her car. We drove up the hillside, past Bono, to the house in which Helen grew up, and where her mother still lives. 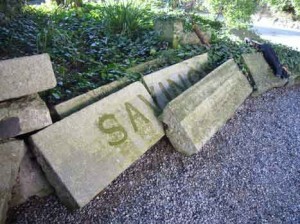 Immediately, in the front garden, were these dressed stones; inscribed “Savings Bank”, they once were part of the Old Abbey Theatre’s Marlborough Street facade. Before getting down to business, we were treated, with Chlora Hall, to a delicious lunch (thank you, Viera!) with a clear, crisp vista from our high vantage point out over Killiney Bay. Bounded by Bray Head and the distinctive peak of the Sugarloaf Mountain to the south, and by Dalkey island to the north, and with the obelisk of Killiney Hill – once known as Victoria Hill – to the west, this is one of the most spectacular views on the east coast, and one I’ve loved from childhood. Window-frames from the Marlborough Street vestibule. Needless to say, by the time lunch was ended, we were in a suitably convivial frame of mind to take on the remnants of the old Abbey Theatre. 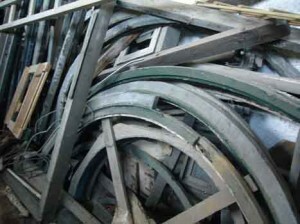 In the old boathouse at the top of the drive is a collection of window-frames and other wooden fittings from the demolished vestibule, the dull green of their paintwork still visible. One would have to lay them out in a row and systematically compare them with photographs of the Theatre’s 1951 facade to make a great deal of sense of them, and it’s unclear (at least at this point in my archival research) whether these are the original frames, or date from a later period. 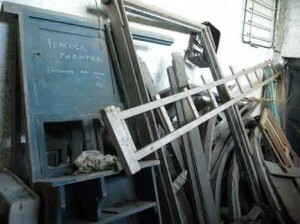 One plain, wooden construct is labelled in chalk “PEACOCK THEATRE ENTRANCE PAY DESK 1961”. D.P.Hanly recounted: “When the plans for the new building [the new Abbey Theatre] were ready in March 1961, the entrance facade and the vestibule, which many still remember as the Abbey Theatre, were being demolished. The contractor, Christy Cooney, told me that his instructions were to dump everything. I was horrified that this last historic part of one of the most celebrated theatres in the English-speaking world would be lost for all time. I asked him, please, to number each stone and to ‘dump’ them in our garden at home instead. He said he would be delighted and this was done.” (“The Man with the Abbey Theatre in his Garden” unknown journal, section heading “Inner Vision”, p.55). In a second, smaller outhouse, were finds of a different sort: heavy, slate counters, billboards and signs dating from the 1930s, and a scale model of the old Abbey Theatre – undoubtedly the one published by James W. Flannery as Plate 1 in W. B. Yeats and the Idea of a Theatre: the early Abbey Theatre in theory and practice (Yale, 1976). Nobody had seemed to know what had become of this model, so it was an unexpected joy to happen upon it here. This, of course, is a digital modeller’s dream: although care must be taken. The model is labelled: “Showing the collection of buildings occupied by the National Theatre Society in 1904.” More accurately, as Holloway’s drawings in the National Library attest, the model shows the buildings that the Society gradually acquired over the years, starting in 1904. 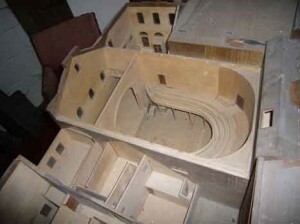 Although each detail will have to be checked and cross-checked against other sources in order to assess its accuracy and, in particular, its degree of correlation with the earliest phase of the Theatre, the model undoubtedly gives us an extraordinarily useful three-dimensional impression of the internal and external architectural framework of the old Theatre. Finally, we went out to the long, garden to the rear of the house, to see what has to be the most enviable garden feature in Dublin. 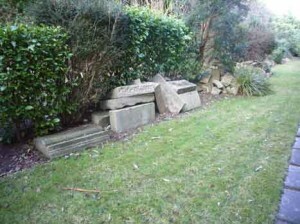 Small, seemingly haphazard, piles of dressed and rusticated stone lie deposited in the planted borders. At places, ageing shrubs throw their limbs protectively over discarded cornices and lintels, while elsewhere a gentle shawl of moss and pine needles enfolds the granite into the hillside landscape like the return of an erstwhile estranged child. Here and there, half-faded numbers, in white paint, remain visible. Ensconced within the natural theatre of Killiney Bay, the monumental historical weight of Hanly’s stones offers an odd frisson. Researching for the 3D Old Abbey sounds as good an adventure as the story of the original one! The model is great – could you post just the basic real life measurements of the architecture by any chance? The look of it reminds me of Wilton’s Music Hall on the East End..